Like many of you, when I read Brené’s The Gifts of Imperfection, I was captivated by her research and her languaging of what I have struggled with much of my life. I remember reading through this book underlining paragraphs and writing personal thoughts in the margins all the while talking about with everyone I knew. Parts of me led life through the lens of perfection believing this was the best way to live and do life. As destructive as all or nothing thinking is – it also provides a container of control and purpose to protect – giving the illusion this approach to life is sustainable. Until it isn’t. I now know perfection is a fierce protector. Hustle. Numb out. Focus on the results. Or do not try at all. Perfection thinks it is the ultimate safety armor. And yet it also ends up wreaking havoc on faith, health, confidence, courage and creativity because the anxiety of perfection fuels both overfunctioning and underfunctioning. There is great cost to living a life led by perfectionism. It is related to loss of revenue and professional opportunities scarcity mindset, relationship difficulties, physical and emotional health problems all the while crushing confidence, faith, calm, and clarity. A life led by perfectionism costs us our sense of what it truly means to feel worthy – regardless of what we do or what others think. And it sure fights to keep status quo as it fears moving away from this lens will cause more pain and struggle. Reading Gifts of Imperfection shifted so much for so many. And years later, we are having brave and honest conversations about perfectionism. It has been powerful for me and many I know to have “Me, too.” conversations around this topic. At the same time, all of the insight and awareness around perfectionism has created perfectionism around not being a perfectionist. In essence, perfectionism can hijack the process of trying to move away from the perfectionism. It is an interesting beast, for sure. Behind perfection is shame, anxiety and fear. There is nothing pretty about these emotions and the impact they have on our lives and the world around us. But the pain needs to be unburdened – not stuffed, minimized or camouflaged or they will keep hijacked what you desire most: connection, confidence and safe community. Which is why I am offering a workshop focused on the fierce protector so we can get curious about its intent and discover ways to shift away from a perfectionistic mindset without triggering feelings of overwhelm. No one can ever see me struggle. Why try? It will not be good enough no matter what. I am obsessed with eating healthy – food is good or bad and my body is the enemy. I can’t stop counting calories. If I do, I will lose control and not be desired. You are the one who has to keep it all together. You can’t struggle. …. then perfectionism is still trying to protect you the best way it knows how. And at the heart of these emotions lies trauma, betrayal, attachment injuries, rejection, loneliness, confusion. If you try and fix perfectionism without digging deeper and doing the work to heal the root of the pain, you will only get temporary relief. And this work is not easy. But it can be so fruitful. It never ceases to amaze me what we learn about ourselves because we have the help of trusted support. We can’t think ourselves through the pain – we have to feel our way through it. Perfection says fix it now and be done. Wisdom says this is a lifelong process. My excitement about doing the work to (re) define perfection is in part selfish as I am doing this work continually myself. Safe community is a powerful space to continue to rumble with perfection and (re) define its role in your life. If the pain of perfectionism resonates with you, I encourage you to consider joining us in San Diego on May 18-20 for (re) Define Perfection: Choosing Flexibility Over Rigidity – which is part of our summer mental health series for adults. You’ll learn how to implement daily life practices to help build the resilience and courage needed to show up in life with both boundaries and an open heart. Learn More. What do you rumble with this most? How is perfection costing you? I want to hear about your experiences with perfection and rigidity and how you are tackling this common issue. Peter Block in Community – The Structure of Belonging. At Potentia, we understand the deep need for all of us to find a place to belong. We also know first hand hand how easy it is to let parts of your story hijack your present and your future. Our culture’s mixed messages around what it means to be well can fuel fears of being misunderstood, keeping many scared while rumbling in secret with stories of struggle, afraid of losing what matters most – connection. Addictions, betrayal, mental health struggles, grief, trauma, perfectionism and shame touch all of us directly and indirectly through those we love and lead. Attempting to try and think yourself out of your pain often exacerbates the pain fueled by the barriers of stigma + access to resources – keeping way too many people in isolation. it is easy to forget that struggle is not failure but a place of growth, wisdom. And every rumble to heal has a timeline of its own – so caution against comparing your struggle to the journey of others. I know we are biased on this matter but we believe one of the best gifts you can give yourself and your loved ones is to make healing emotionally something to respect and value. Our hope is that you will make your mental health a priority now and in the new year. Leaving mental health issues unaddressed will make it harder to achieve your goals, desires, dreams, and to find that sense of deep belonging within and with those in your life. Yes… the time, resources and energy that is needed to heal is nothing but tidy and streamlined – any quick fix plan offered to heal deep soul pain will fall short of you showing up day in and day out to do the messy work to heal. Slower is often faster when it comes to mental health healing. Making mental health a priority in your life will help you show up in your life with more clarity, connection and confidence. All of us at Potentia continue to invest our own time and resources studying, training, consulting and collaborating – along with supporting our own mental health – so we can offer our clients and their families the best support. We also believe you play a crucial role in the process of changing the stigma around mental health issues. By doing your own deep soul work, you are leading by example. Your courage in this process will be contagious and inspire others to take the brave leap to ask for help. Cheers to (re) Defining Health in 2017! Keep us posted on how we can be a resource for you. PS – We would love for you to come to our I Choose Respect Open House + Fundraiser on January 14th, 2017 from 4-7PM. Local artists and makers will be featured along with great food + community plus our I Choose respect photo booth as we prepare for our 4th annual I Choose Respect effort. Click on the image below to register! Preparing for my talk at Flood Church this weekend on “Parenting in a Culture of Never Enough”, I wrote this slide inspired by a week that stretched me with my own children. Whether you are parenting your children, caring for your pets, or anyone in your charge – it hurts when your loved ones hurt. Becoming a parent was not a life-long dream for me. I was wary at best. Then I met my husband and I took the dive into this role knowing he was a voice of reason and strength at my side. Now I am all in with two little people who expanded my heart and continue to stretch me in ways I did not know I could be stretched. My husband and I found new edges in our relationship when our first child was diagnosed on the autism spectrum. While the diagnosis gave us a framework to understand her brain and nervous system, she was her own unique person who did not fit into any mold. There is a saying within the autism community: If you have met one person with autism, you have met one person with autism. Parenting a child on the autism spectrum may not be very different than parenting any other kid – there are good days, hard days and days you can barely breathe. However we get there, I believe we all can relate to the roller coaster of emotions involved in being responsible for a loved one. This week took me to the ‘barely breathe’ edge as my daughter’s nervous system made wearing clothes, smelling certain smells, seeing anything she deemed “gross”, hearing sounds at a certain volume unbearable. Everything hurt. What feels like a tap to you and me felt like a punch on her skin. Noises we barely notice were causing her to cringe. And when that kind of assault on a nervous system is going on, she responds like most of us – fight and flight, but mostly fight. My girl can scream and turn on herself in an instant. It can be dizzying. And when her brain goes into limbic mode, she has her own shame spiral to reckon with as she hates feeling different and doing things that may not respect herself or others. It takes a lot of energy to hold space in these moments. When those I care about hurt, I hurt. Their hurts + my hurts intersect and in a millisecond my brain decides whether to let the feelings wash over me or go into fight, flight, freeze or numb out. I love my passionate, deep, brilliant, brave daughter. My love does not waver but I sure want to shrink from it when others give witness to her pain, my pain. There is nothing cool, smooth, elegant about a public meltdown. In a culture that says you are not: enough, doing enough, strong enough, Christian enough, calm enough, professional enough, wealthy enough, cool enough, skinny or fit enough, have-it-all together enough – the pressure can feel like something fierce. It hurts to see my daughter misunderstood. I know it hurts her, too. And my own stories of feeling misunderstood, ashamed and alone get activated during these times too – whether I know it in the moment or not. Both of our nervous systems were hot messes this week. My colleague Bobbi Hannah, an occupational therapist here in San Diego, sent me this chart after we recently were geeking out talking about the nervous system. She shared how the impact of too many “dings” on our nervous system can lead to us feeling flooded, shut down or taking measures to defend ourselves from more triggers. I gave her an ‘amen’ as I see this so much in my daughter, myself and many of my clients. This metaphor also fits with all I have learning in my EMDR training and other trainings + readings from people like Bessel van der Kolk, Dan Siegel, Richard Schwartz and more. When we get enough dings on our nervous system, our hearts, our souls – we start to engage in protective choices which may not be aligned with our core values. Shame creeps in and we may begin to believe the lies of scarcity mindset which is a cocktail of shame, comparison, competition, fear and loneliness. In those moments of feeling exposed, confused and helpless – it is a nervous system overload. The shoulds, the supposed to’s, the rules, the plans – they can get all jumbled up between your loved one’s pain and your pain. The default is to stop the pain of your loved one so you stop hurting – and sometimes we attempt to shut down this pain in ways that lead to some serious empathic failure. Making the choice to stay calm, respectful and patient happens. But not as often as I would like. Frustration, fatigue and vulnerability can get the best of me during these times. We all mess it up and want do overs. But that is the awesome thing about grace and failure – we get to teach how to fall and fail well – and rise again after those moments where all we know to be true and right goes out the window as we jump to shut down the pain in ways that make everyone feel crappy. How we handle struggle – our struggles and the struggles of those we love – can potentially be powerful medicine for our relationships and communities if we dare to be vulnerable. The pressure to never fail, mess up and make a mistake can be immense. Perfection says if you are not perfect, you are letting your loved one down. But one of the biggest gifts we can do is show how we recover when we mess up. THIS is the space of courage, grace, learning, inspiration and connection. Yes, falls and failures invite the naysayers, the shoulders and the I-told-you-so voices. Digging in and dealing with past and present hurts is ground zero for responding differently when the hurts of our loved ones collide with our hurts. All of us on the Potentia team are honored to support people who desire to respond to differently to discomfort, pain and shame so not hurt themselves or others. Sometimes this work is nuanced and takes time. And sometimes it just takes a period of getting outside your head and finding out you are not alone in your struggles. It is brave work loving people and navigating the messiness of real, honest, meaningful relationships. And when the dings get too much, remember you are not meant to struggle alone. Daring to reach out and ask for help is a powerful example to model to those you care about. Keep showing up. The dark emotions are part of being human. And never forget we are all on this deeply human journey together. Struggle does not equal failure – and other thoughts on struggling. Last spring I had the chance to give a talk on a topic that is near and dear to my heart: body and story shame. One of the slides I shared during my talk – featured at the top of this post – garnered the most feedback from participants. I was struck by how powerful this statement was to so many and what a relief people said they felt when they gave themselves permission to separate struggle from their worth and value. This feedback echoed one of the most common frustrations I hear from people about their frustration with the presence of struggle in their lives and the suffering that often ensues. Comparison is a beast to reckon with when it shows up. Our brains think comparison is helping us get safe when in fact it just pushes us deeper into the tar pit of fear and frustration. I have given witness to countless individuals who realized what they believed about struggle was fueling shame. They decided to take a leap of faith and reach out for support – hoping a different approach to their struggles would offer much needed relief. Struggle means I am a failure. I am always going to struggle. A life without struggle is possible and if not achieved, you are doing something wrong. There is no place for struggle at work or in relationships. Struggle means it is all my/their fault. When something is achieved without struggle, it is not worthwhile or valued. I believe struggle is crucial to healing and growth. My desire is to continue to grow, heal and learn for the rest of my life, so I know struggle will be a reluctant companion of mine for seasons. It is now important for me to reflect on how my struggle came to be and what has/has not been done to achieve change but also how I respond to the struggles I face. Be wary of responding to struggle with perfectionism: look perfect, act perfect, be perfect, never let people see you struggle, never let anyone struggle or be disappointed. Perfectionism keeps us frozen in homeostasis, squelches faith, keeps us chasing the unattainable and robs us of the opportunity to build our bandwidth for struggle. Also caution against responding to struggle with shaming, finger-wagging questions like, “Why did I do that again?” or “Why do I not have this figured out by now?” or “I know better, why I am still struggling?”. Taking a posture of curiosity and respect when looking at your struggles or those of your loved ones is crucial. Turning away from the seductive reactivity of judgement, blame, gossip and numbing when struggle arises is also important so not to devalue the pain and uncertainty struggles trigger. Struggle is data not an identity. Struggle is a place of refinement. Struggle can help discern if it is time for an ending, a change of focus or direction. Struggling refines and builds fortitude. Struggle is opportunity to engage and move through the pain, uncertainty and fear. Struggle is where discomfort and breakthrough meet. Please note: While I believe struggle is a foundational ingredient to sustained change, if struggle ever involves physical, emotional, spiritual abuse it is imperative you remove yourself from the situation and get safe along with the appropriate support. While we are walking this planet there is not a guaranteed end to struggle – which makes all of us susceptible to believing offers of quick and easy ways to deal with the pain of struggle. I am very suspicious and often frustrated with people who offer quick fixes to pain. These gimmicks feed on fear and exhaustion with well-written promises that are enticing by speaking to your pain points. Good marketing is just that – good marketing. It even gets to me and causes me to challenge what I know to be true: there is no way around the pain of struggle except through it – taking one step at a time while using hope as a flashlight in the dark. We also need to caution against equating the duration of our struggles with our worth. We like the certainty of quantifiable data and there is indeed a good amount of information available which can provide perspective and frameworks on your expectations around struggle. There are many excellent resources available in books, blogs and courses to learn, grow and develop important practices which can revolutionize how you engage with life. But one-size-fits-all formulas which fuel unrealistic expectations and offer a cure to our struggling are misguided. To change the narrative around struggle, we need to improve our bandwidth and tolerance for struggle along with the messy and uncertain. Doing the work to address trauma and distressing life events in your story is an important place to begin or continue healing. We are big proponents of EMDR Therapy at Potentia because of its efficacy, the research behind it and the respect it offers when addressing the tender parts of a client’s story. There is nothing tidy about being a human who desires to engage in a life full of meaning and purpose. Figuring out how to set and maintain boundaries (not walls), getting clear your core values (which help you set boundaries) and building a sustaining shame resilience practice are necessary components to the journey of being human. The story you tell yourself about struggle can have a powerful impact on how you show up in your relationships and at work; how you pursue dreams, handle rejection and disappointment. What is the story you are telling yourself about struggle? Start by sharing your stories of struggle with people who have earned your trust. If you do feel like you have someone to trust with your unedited story, write it down and start wrestling with all aspects of your story of struggle with a posture of respect and curiosity. It is my hope you view struggle not at something to erase or mask but instead a space where redemption and grace ooze and fill in the holes of pain, loneliness and shame. The (re) Define Body Image:Choosing Respect Over Body + Story Shame e-course will be launching again this fall on October 5th. It will be a pay-what-you-can fee, though the suggested rate is $97. I am also going to be giving the (re) Define Body Image: Choosing Respect Over Body + Story Shame talk I referenced at the beginning of this post at San Diego First Church of the Nazarene on September 19th from 9AM-12PM. Email me at rebecca@potentiatherapy.com and I will send you the registration details when they become available. As hard as it is to lose an hour of sleep, the longer days are very welcome. 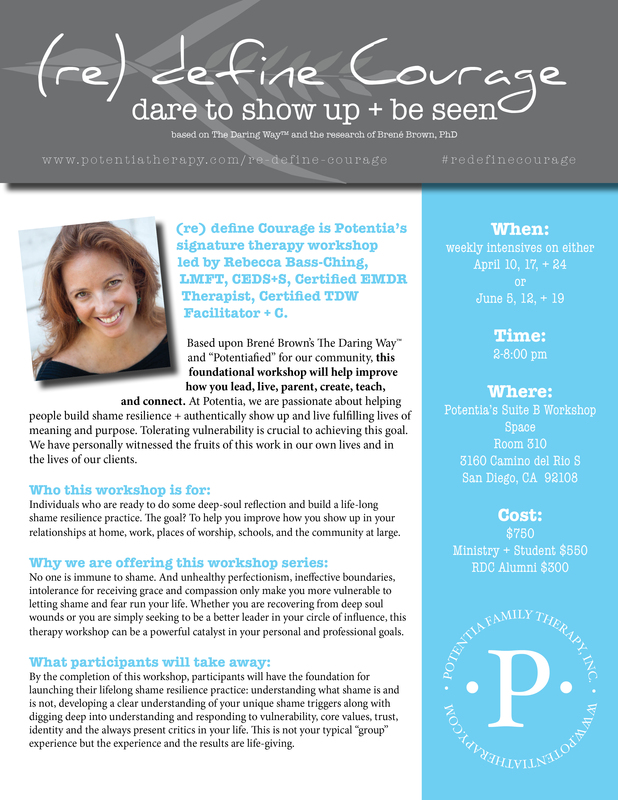 (re) Define Courage: Dare to Show Up + Be Seen Weekly Intensives: Kick off your life long shame resilience practice in this workshop series based on Brené Brown’s research on shame, authenticity and vulnerability. With April and June offerings – parents, educators, students, ministry and business leaders, wellness professionals and more can all benefit. For MFT students and interns, 18 group hours can go towards your BBS personal therapy requirement. 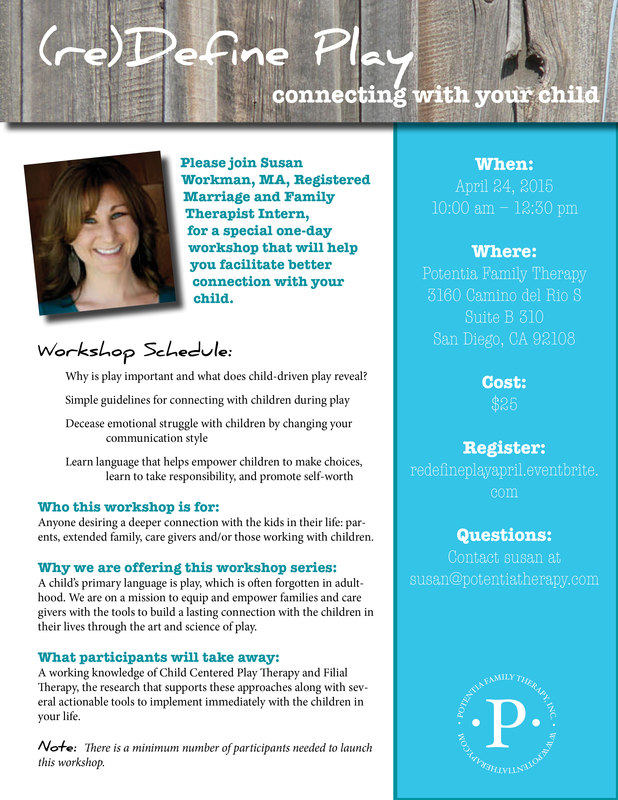 (re) Define Play: Connecting With Your Child: Whether you work with kids in your profession, are a student, parent, grandparent, aunt/uncle or just want to learn more about engaging with young children, this engaging workshop will help support a meaningful relationship with the little people in your life through the power of play. Learning Lab: Engaging Clients with Action featuring Jean Campbell. LCSW, TEP: It is an honor to have Jean lead this informative workshop about the powerful experiential approach of psychodrama and how to utilize this modality with individuals and groups. In addition, I am offering individual and group consultations for those working towards their Certified Eating Disorder Specialist and Certified EMDR Therapist credentials. Email me for more information. The Potentia Team and I look forward to seeing you at one or more of our offerings in the weeks to come. In the meantime, make sure to get some sunshine on your face and enjoy this new season! to want something to happen or be true and think that it could happen or be true. There is no room for cynicism where there is hope. Hope is a brave stance that requires faith in the unseen. At Potentia, I witness this kind of hope in action daily. I see people discover their agency to heal their relationship with God, their story, their body, their relationships with others. I see despair, struggle, defeat and deep disappointment, too. In these times, hope is subversive and supports resilience to life’s pain. My understanding of the relationship between hope and despair shifted after a workshop Potentia hosted last summer for all of the Southern California members of The Daring Way. Robert Hilliker, LCSW, LCDC, CDWF-C led a rich presentation and discussion loaded with powerful insights on hope and despair. 2. Hope is sharing our story with those who have earned the right to hear it. Hope empowers us to own all of our story and not just the parts we deem worthy. 3. Hope is a key element in creating change. Without hope, change is unlikely. 4. Hope is not the same as wishing, which is a fantasy and an ideal. Hope is dealing with the practical aspects of living. 5. Optimism is purely a cognitive construct. Hope is a cognitive construct and a relational function. Hope is a mind and heart approach. 6. Hope is active, not passive. Additional considerations for practicing reasonable hope: believe that making small advances in service of a greater goal are not trivial. 8. Robert reminded us we need to be brokers of hope. We lend hope with the hope that our clients will eventually internalize it on their own. I think anyone on the fronts lines with someone struggling can be a broker of hope. When we dare to show up with anyone hurting, we do not just talk about hope but we do hope. Hope becomes a verb instead of a noun. 9. Robert challenged us to not miss the here and now when we are with people who are struggling. Sometimes in our attempts to “make sense” of a client’s story we miss the hope in the now. Anxiety has a way of trumping our ability to stay present with those hurting in our presence. Often our blind spots from our own untreated wounds impact our ability to stay in the moment, too. The super power of hope can simply be sharing space with the hurt – in the moment. 10. I love this one: When you are with someone who says they have lost hope, ask them, “Where did hope go?” Often a powerful and meaningful story will unfold. When you share story, the loneliness of despair is transformed by the collective power of the fact that we are in this life together. 11. Hope and despair can share the same space. In fact, it is important to recognize the importance of and respect both. Often, we just want to focus only on the possibilities hope offers but we do a disservice to the story of struggle if we do not honor despair, too. 12. Challenge the flawed narrative that in order to do great things we have to be perfect. To quote Glennon Melton, life is brutifal (a fusion of brutal and beautiful). This is not about letting go of healthy striving but choosing flexibility instead of rigidity. Finding good enough is indeed great and realizing the ordinary is indeed extraordinary. 13. The opposite of scarcity is not abundance but enough. We live in a scarcity culture that challenges our worthiness and relentlessly fuels shame. Part of a sustained shame resilience practice also incorporates a hope practice. 14. In order to grasp the concept of hope we have to trust that pain and despair hold the key to growth. Resilience is not about never feeling the pain of despair but responding in ways that do not harm self or others we do experience struggle. All stories have themes of resilience and hope. Sometimes, you may need some help cleaning the lens on your life to see this perspective. 15. Never underestimate the power of agape love – soul connection – and respecting your profoundly human story. Deep-soul work that addresses the distressing life events knocks down the barriers to leaning into agape love. Along with the Potentia team, I am honored to be a broker of hope when life is brutifal. I am curious how you desire to be a broker of hope this Christmas season? What do you think about pain and despair being the key to growth? I really appreciate the leadership of Delta Delta Delta and their vision for Fat Talk Free Week. This year’s Fat Talk Free Week kicks off tomorrow and runs through Friday, October 20th. I value taking a week – with the hope it will extend longer – to intentionally redirect fat talk in our heads, with our friends or about others to more honest, life-giving, respectful dialogue. We all need a break from the “I am so___”, “If only I were___”, “I hate my _____”, “I am not ______ enough” conversation. Bullying others or ourselves with fat talk only fuels deeper pain and fat talk represents attempts to manage the parts of our story triggered by pain, fear, loneliness, anxiety and more. Which is why taking a break from the fat talk is important. Even more important is to get to the heart of the meaning of our fat talk by talking about our hurts in a constructive manner – with the right person at the right time. Taking a break from fat talk does not mean stuffing your pain. Early in my training in the treatment of eating disorders and trauma, I was told “fat” is not a feeling. Over a decade of treating men and women taught me differently – that it is often a fight to have a positive relationship with their body and their reflection in the mirror. They also taught me how the quick fix pressure to “just love their body” often backfired because they felt so ashamed for not loving, let alone liking, the body they have been given. So, yes, stopping the fat talk is needed. Desperately. But we cannot stop there. We still need to talk about how we are feeling and develop a better way to tolerate struggle and negative emotion. Distressing life events, brain chemistry imbalances, family of origin, temperament all can alter our trust in ourselves, our bodies and others. When we are feeling out of control – focusing on our bodies or comparing ourselves to others is a common default. Turning on ourselves or others with biting, judgy, harsh words only fuels more biting, judgey, harsh words. At the heart of fat talk is a lot of hurt and insecurity which needs to be voiced and given some air time. Our struggle feeling comfortable in our skin along with our desire to feel connected is real. Fat talk is an attempt way to hot wire connection or appease our inner critic. What we really are searching for is to know if we are ok, we are loved, we belong. When there is doubt about our worthiness, we often look to others to approve or disapprove of our worth. We all struggle with this dance. Belonging and connection are innate desires. And for those with faith, I see this matter of worthiness dig even deeper as they feel like they are the exceptions to God’s wild and radical love and grace. It is a constant recalibration to stop externalizing our worth to others and redirect our worth to the One and those who truly matter. Fat Talk Free Week is not just about semantics or becoming the word police. It is a chance to listen to your heart and see where you are feeling convicted for operating outside of your authenticity. When fat talk surfaces, it is an opportunity – and a risk – to change the conversation. Words are powerful. Your voice matters. Choose wisely. I know there is never a lack of events, meetings, parties and kid activities to add to your calender but I am hoping those of you in the San Diego area can squeeze in some time to drop by our Celebration and Open House next Friday, October 24th between 4-8PM. It will be a great time to not only see the new workshop/play therapy space and meet the new Potentia therapists but also to connect with other friends and colleagues from the community. Great food – including a pumpkin “everything” spread – and a chance to win some fun raffle prizes are added bonuses for stopping by our gathering. Please register if you can attend so we can plan accordingly.